Taking Pictures Like a Professional TODAY"
Starting in the early 1900s, photography became a pastime that grew quickly in popularity. Back then, people had very primitive equipment that required quite a hefty investment and a lot of time to take good pictures. Over the years, photography has evolved into a million-dollar industry and something that nearly everyone participates in for different reasons. Most often, pictures are taken to capture memories and suspend them in time. If we didnt have pictures to remind us of times past, how would we be able to share our life moments? Now that computers have become mainstream, it only naturally follows that cameras would go the way of technologically advanced as well. Digital photography has grown to obsessive proportions in the last few years. Its now considered outdated to have a camera that actually holds film. There are some very good reasons for that. Digital cameras allow us to capture all the right images at the right times. We can delete the pictures that we dont like and re-take them as often as we want. We dont have to worry about wasting film when there is no film to be wasted. Photography Isnt a Gamble Anymore! What you need to know is that along with this new technology comes certain adaptations that have to be made when it comes to picture taking as we know it. The cameras are different now, but the subjects are the same. Setting up great pictures takes a little know-how and it always has. But in the digital age, brings with it new considerations that have to be addressed when taking your pictures. Shutter speeds, flash settings, ISO, and shake stabilization are all things you should know about before you start taking digital pictures. Thats why Im offering you this amazing new book: Digital Photography: Take Pictures Like a Pro! Ive had a digital camera for a few years now, and have often become frustrated when I was not taking the kinds of pictures I wanted. Photography has always entailed certain details that cant be avoided. Professionals have known about these things for years, but now in the digital age, even they have to learn the ins and outs of digital photography. Learn Right Along With the Pros! 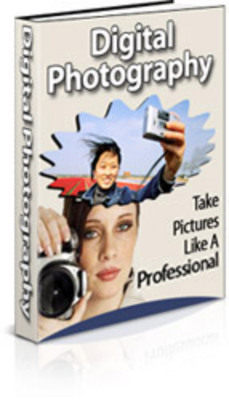 This book is perfect for the novice photographer as well as the professional. It offers up practical advice on everything from taking portraits of friends and family to shooting the perfect sports photo. Youll learn how to shoot landscapes that will take away your breath and so much more! We give you over 25 tips on how to set up the perfect portrait, 17 tricks for shooting beautiful landscapes, and 32 pieces of advice on making your pictures pop with life. Nowhere else will you find so much information in just one place! There are many places you can go to for advice on taking great pictures. You can ask family or friends, read several books, buy a bunch of magazines, or surf the Internet. Why would you want to waste your time when Ive got everything you need right here. Its a Comprehensive How-To Guide! In the digital age, pictures are no longer a question of whether or not we can get the right shot. Almost all digital cameras today come with LCD screens that allow you to view the pictures and delete them if they arent what you wanted. Plus, if your pictures come out with excessive background images and distortions, you can use software on your computer to correct anything thats wrong. My own mother has finally come into the digital age of photography. Being a baby boomer, she resisted cell phones, then computers, and then digital cameras. But now that shes exposed herself to these new tools, shes so glad she did. I didnt realize that I could actually take better pictures with a digital camera. I figured that what I saw on the screen was what I was stuck with. After seeing the information in this book, I realized that with a few key- strokes, I could make my pictures so much better! Whats even better is that you can take your pictures and have a little fun with them. Pose your family in an old-fashioned pose then make the picture itself look like its antique! Add some fun borders or some text to your photos so you can always know when and where the pictures were taken. Making digital photography easy is what Im trying to do. And I have done it! When you order Digital Photography: Take Pictures Like a Pro will make you more knowledgeable than you ever thought you could be when it comes to shooting pictures with your digital camera. When you start with the best information, youll be happy. And thats what Im offering the best information. All of the tips in this book are taken from professionals in the field and put together in an easy-to-read format that anyone can understand. When you click the order button right now, this book will be delivered right to your e-mailbox. Itll be yours to refer to time and time again. When you have this easy reference guide, you can open it up while youre editing your photos and put the information we give you to use right away. The best part of all is that Im offering you this book for only $9.99. You could pay three times as much for books on the subject to get you to the level we can get you to. You could spend hours surfing on the Internet and find just a portion of the information Im giving you. making money from Photos! The sofware is worth more than $9.99 alone!